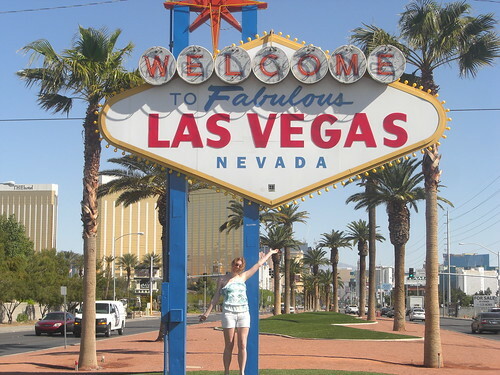 Continuing on her American Road Trip, Jenny parties in Vegas, meets the cowboys and cowgirls of Texas and finds out what Mutton Busting is! So with a few secrets tucked in our suitcases we moved down south along miles and miles of empty roads to Texas. There was a point while driving down the iconic Route 66 that Jane on the satnav said ‘turn in 356 miles’ … now that is what you call a whole lot of nothing. Straight, straight roads stretching ahead with little more than the occasional tumble weed or road runner for entertainment. First stop in Texas was Dallas. I recommend a trip to the 6th floor Museum of the Dallas Book Depositary where you can learn more about President John F Kennedy’s sad death when he was allegedly shot by Lee Harvey Oswald. If you take the audio tour I can guarantee you will have tears running down your cheeks by the end of it as you learn about the sad death of one of America’s greatest Presidents. Next we stopped for some partying in Austin. Now Austin is the antithesis of everything Texan, you are more likely to feel like you are back in California. The chilled out hippy vibe, the endless supply of quirky shops and cafés and a completely natural swimming pool at Barton Springs… it was like swimming in Evian water. Our evening in Austin involved live music in jazz and blues bars, dancing on the bar at the Coyote Ugly bar and drinking with four US Army boys who were more than thrilled to be partying with English folk… our accents were just ‘sooo cute!’. 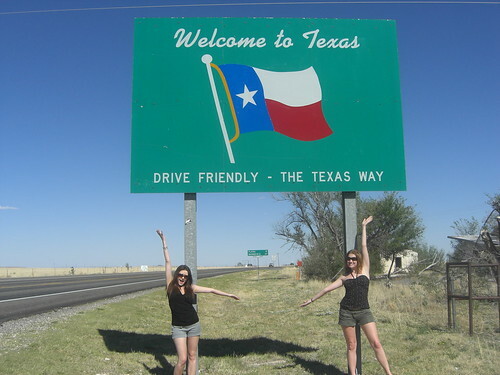 There is so much to see and do in Texas, from visiting NASA in Houston, learning new history in San Antonio and Dallas to eating the largest food portions of your life. But there is one thing you absolutely MUST not miss when in Texas and that is… visiting a rodeo. Think of how you would imagine Texan cowboys to be dressed.. Wrangler jeans, cowboys boats, checked shirts, big belts with large belt buckles and of course a cowboy hat .. And you would have it exactly right! Now imagine about a thousand in one place, along with cowgirls in the matching female equivalent! We arrived to an arena filled with cowboys and cowgirls only to feel instantly out of place with our flipflops and Steve's manbag, but hey we're from England so it’s all ok! After much thanks to god and America it was time to get down to the real action.. Bull riding! We watched Corey, Cole, Cody, Jimmy, Joe and Jason and numerous other cowboys get battered around for less than 8 seconds on big fat angry bulls! After the bull riding we saw some steer wrestling where cowboys gallop after the small cows and jump off their horses to wrestle the cows to the ground by their horns.. A real mans sport!!?!! Top event of the night was Mutton Busting… Know what it is? I'm guessing probably not. 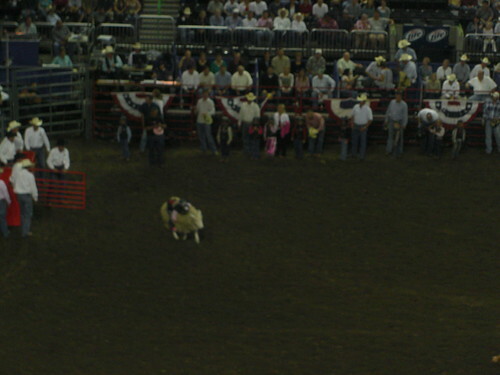 Mutton Busting is a 'sport' that children of between the ages of about 5 and 8 take part in. They get put on the bare backs of long haired sheep and have to cling on for as long as possible as the sheep run around until they fall off! Yes this is actually a sport and yes parents get their small children to partake! - Only in Texas! Other sports of the night included the 'calf scramble' where slightly older children are let loose with a bunch of small calves and race to be the first to catch a calf, battle it to the ground and drag it to the middle of the arena! All in the name of entertainment right?!! Now these so called sports may not even be legal in the UK but if you are after a true Texan experience you just have to stop by a rodeo… though whatever you do… don’t forget your cowboy hat. Fancy visiting a Texan rodeo for yourself? Our expert consultants can help you plan your dream American road trip. Call 0208 045 4186 or visit in store. Follow Jenny on twitter for her latest travel adventures.